Among the vast body of literature that has grown around Rett syndrome, this volume is the first to be aimed at both clinicians and researchers. It presents a comprehensive overview of the disorder and examines the areas where gaps in knowledge are most significant. 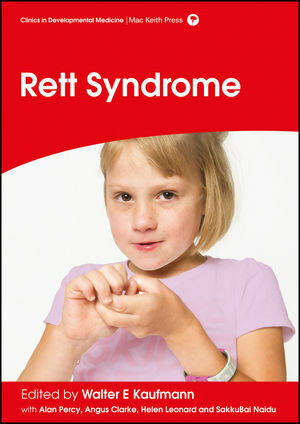 Rett Syndrome is intended to be a guide for both initial examination and in-depth study of the disorder. It is a practical text for the physician approaching the disorder for the first time and a valuable reference resource for the specialist or researcher. Walter Kaufmann is Director of the Center for Translational Research and Curry Chair in Genetic Therapeutics at the Greenwood Genetic Center, South Carolina, USA. He is a clinician and researcher whose career has focused on characterizing the neurobehavioral phenotypes and underlying mechanisms of genetic disorders associated with intellectual disability and autism. His focus is the development of novel therapies for these disorders, including outcome measures and biomarkers for the corresponding clinical trials. Dr Kaufmann has carried out most of this work at the Kennedy Krieger Institute and Harvard Medical School (Boston Childrens Hospital) USA. Alan Percy is a Professor in Child Neurology and currently the Interim Director of Clinical Neuroscience at the Civitan International Research Center, University of Alabama School of Medicine, Birmingham , USA. He trained in paediatrics at Stanford University Hospital and specialised in paediatric neurology at the Johns Hopkins University School of Medicine. Rett syndrome is his main interest. He has authored over 250 monographs, book chapters and journal articles. He is co-editor of the journal Translational Science of Rare Diseases and is on the Advisory Board of Rettsyndrome.org. Angus Clarke is Professor and Honorary Consultant in Clinical Genetics at the Institute of Medical Genetics, University Hospital of Wales, UK. He established the Cardiff University MSc course in Genetic Counselling in 2000 and has been Course Director since then. Professor Clarke has particular interest in Rett syndrome and ectodermal dysplasia, the genetic counselling process and the social and ethical issues around human genetics. He has authored or edited seven books and numerous research papers and book chapters. His is also medical advisor to Rett UK. Helen Leonard is Senior Research Fellow and Principal Research Fellow at the Telethon Kids Institute, Perth, Western Australia. In 1992 she established the internationally unique, population-based Australian Rett Syndrome Database and has maintained the register since that time. In 2002 she set up the International Rett Syndrome Foundation Phenotype Database, InterRett, which has now collected data on almost 2700 cases from 57 countries. Her international reputation has been built on over 200 peer-reviewed papers and 12 book chapters. Sakkubai Naidu works as a Pediatric Neurologist at Kennedy Krieger Institute where she also directs Rett syndrome research at the Department of Neurogenetics. Dr Naidu is also a Professor in the Departments of Neurology and Pediatrics at the Johns Hopkins University School of Medicine. Her special interest is in developmental and neurogenetic disorders affecting children and adults. Dr Naidu is a member of the American Academy of Neurology, Child Neurology Society, American Neurological Association, International Child Neurology Society, Neurological Society of India and the American Association for the Advancement of Science.